This Halloween snack is a healthy alternative to mini chocolate bars and candies that are everywhere this season. 1. Place some whole wheat crackers on a plate. 2. For each cracker you are going to need 1 circle of cheddar cheese. I used a small circle cutter I had. You could also use a drinking glass or just use a knife. 3. Using either your knife, or small cutters if you have them, cut a face out of each of your cheddar circles. You’ll need 2 eyes, 1 nose, and a mouth. 4. Place your cheddar circles on top of your crackers. 5. 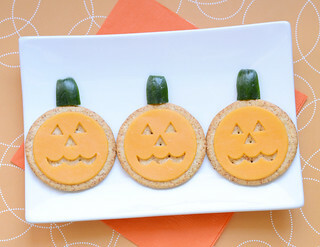 Grab your cucumber and cut small pieces off for the pumpkin stems. Place these stems above each cracker. That’s it! Simple and spooky — what an awesome Halloween treat. Enjoy!